Long neglected or in private hands, Madame du Barry's famous pavilion at Louveciennes is now at last restored and open to the public. This little white jewel of a building has had an adventurous past - the perfume magnate François Coty, owner in the early 1930s, even had it completely dismantled and rebuilt several metres further back to avoid subsidence. In 1991 it was acquired by Franck and Julienne Dumeste who began an ambitious programme of restoration, successfully recreating much of the interior decor, though not all the once-spendid ornamentation and furnishings, sold off in 1795 and scattered or lost. In 2006 the Fondation Julienne Dumeste opened its doors as a venue for cultural and educational events. You can now hold your wedding reception there, or just enjoy "la visite" on Sunday afternoons; definitely one for the "to see" list! In the summer of 1769 the Château de Louveciennes was Louis XV's first significant gift to his new mistress, the Comtesse du Barry. Standing at the edge of the royal park at Marly, the château, which in reality was little more than a lodge, had reverted to the Crown following the death of the Prince de Lamballe in 1768. It had been built originally for Arnold de Ville, engineer of the famous "machine de Marly" which was a spectacular and inconveniently noisy neighbour, pumping water for the royal fountains at Marly and Versailles. Once in possession, Madame du Barry set out immediately to enlarge and improve. At first she entrusted the work to the great Gabriel but subsequently adopted as her architect Claude-Nicolas Ledoux, the young exponent of neoclassicism which was then just coming into taste. Completed in 1771, the pavilion for the park at Louveciennes was one of his first major works, rivalling Gabriel's Petit Trianon, built at Versailles between 1762 and 1768 for Madame de Pompadour. Ledoux's appointment probably reflected the alliance of the new maîtresse-en-titre with Chancellor Maupeou and the abbé Terray who, as Controller-General of Finances and new director of the Bâtiments du roi was the source of seemingly limitless funds for Madame du Barry's patronage of the arts; according to Ledoux himself, Terray had promised him honours and position. Parly as a means of self-assertion, the new Comtesse favoured the modern - in fashion and painting and now, it seemed, in architecture. It is not recorded how she first met Ledoux - perhaps through the Princesse de Montmorency or through Mlle Guimard, for whom Ledoux had recently built a Parisian hôtel. 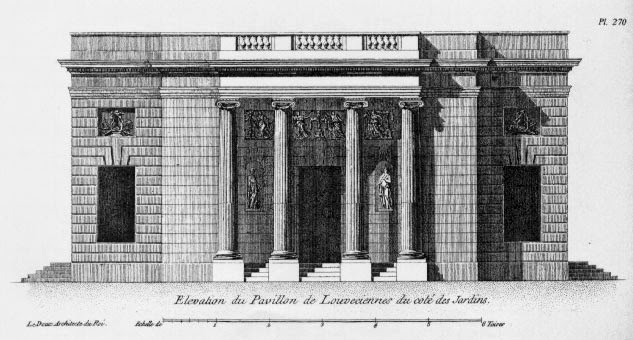 Proposals for the new pavilion were also requested of Charles de Wailly but it was the project of Ledoux which prevailed. The building was ready for September 1771 when the King attended a magnificent inaugural banquet; the Mémoires secrets reported that Ledoux's speedy completion had been rewarded with the posts of Commissaire du roi and inspector of saltworks in Franche-Comté [the famous saltworks at Arc-et-Senans by Ledoux is now a UNESCO World Heritage site]. The interior may not have been finished until two years later when, according to Ledoux, the King paid his first informal visit and spoke in person to the architect. Madame du Barry continued her employment of Ledoux. 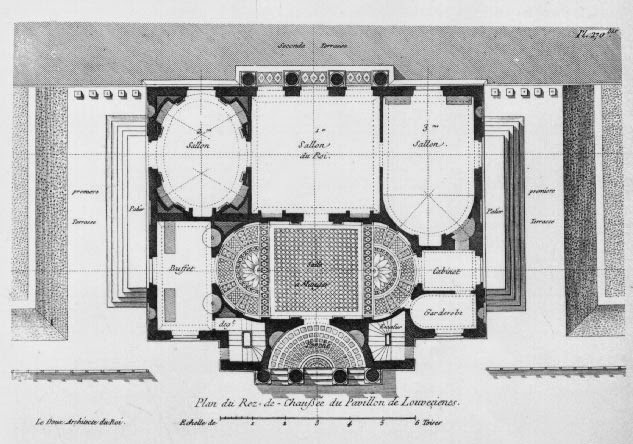 Before Louis XV's death in 1774, in addition to the pavilion, he had completed her stables at Versailles and drawn up plans for a new main château at Louveciennes, and for a large house in Paris. He continued to work for her in exile, first apparently at the Convent of Pont-aux-Dames, and then at the Château of St-Vrain not far from Arpajon, where she stayed for several months before the new king allowed her to return to Louveciennes. The architect himself referred appreciatively to his patroness as "the still lovely and once all powerful proprietress, the charming Comtesse Du Barri". 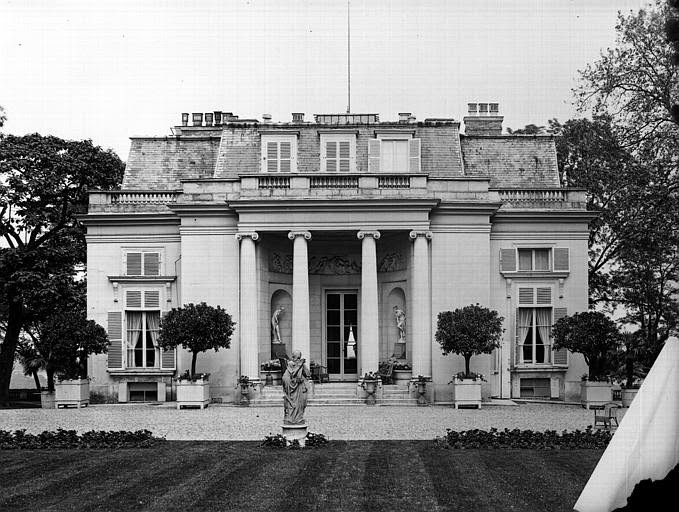 The pavilion, today restyled a "pavilion of music", was essentially a house for entertaining. Madame du Barry herself referred to it as a "folly", which conveys ideas of informality, fantasy and the new intimacy with nature; it was situated in "one of those wild and faintly triste settings which were coming to be the taste". The main château lacked views; but the rear of the pavilion gave onto the Seine with a vista that encompassed Saint-Denis, Saint-Germain and the distant spires of Paris. Doors on either side gave access to the garden, with two circular temples - among the earliest such circular constructions in France - one of which is generally considered the work of Ledoux himself. 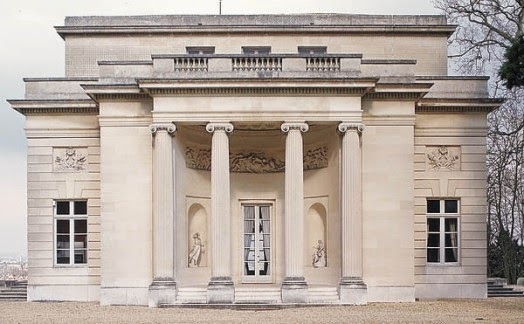 Like the Petit Trianon, the pavilion was an almost perfect square, five windows long in front and three on the side. It was constructed of glittering white Saint-Leu stone, with a songle storey of 25 feet, surmounted by a terrace surrounded by a balustrade. (In the 19th century a second story with mansard roof spoiled the geometric design; there still seems to be some sort of addition to the roof today.) 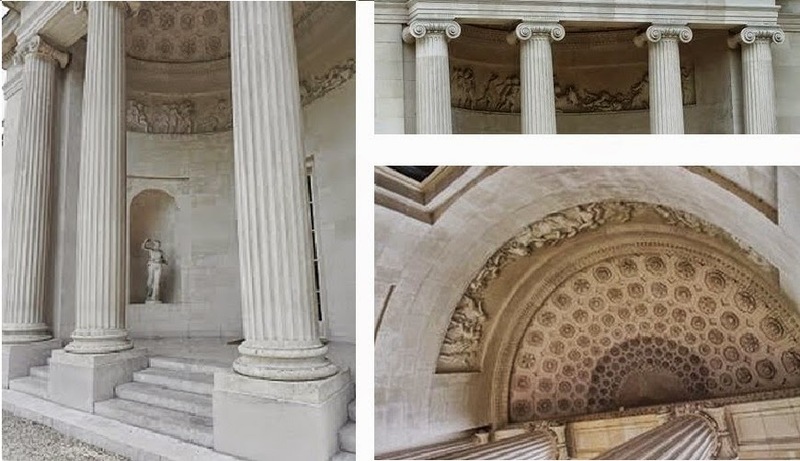 Eight steps led up to a portico supported by four slender fluted ionic columns; the peristyle was covered by a finely coffered (and much marvelled at) half-domed ceiling whilst the pediment featured a bas-relief by Félix Lecomte representing clusters of children in Bacchanalian abandon. 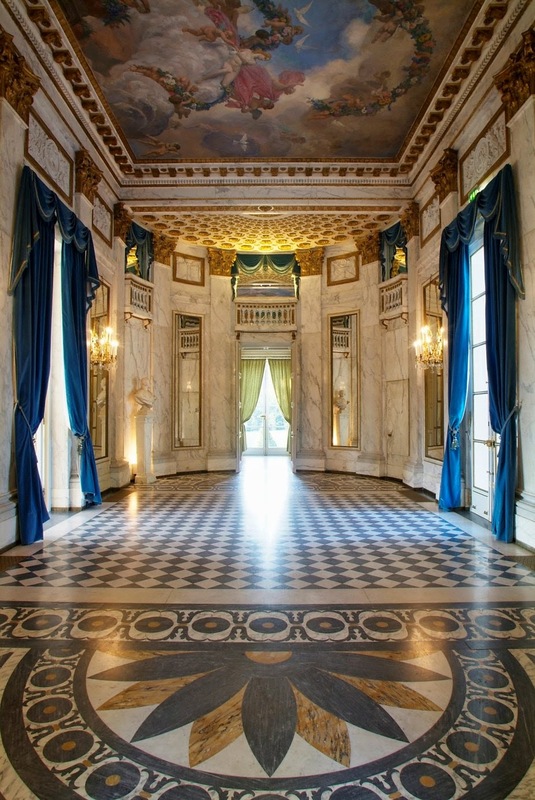 The interior consisted of a large oval vestibule or dining room and, beyond, an enfilade of three adjoining salons. 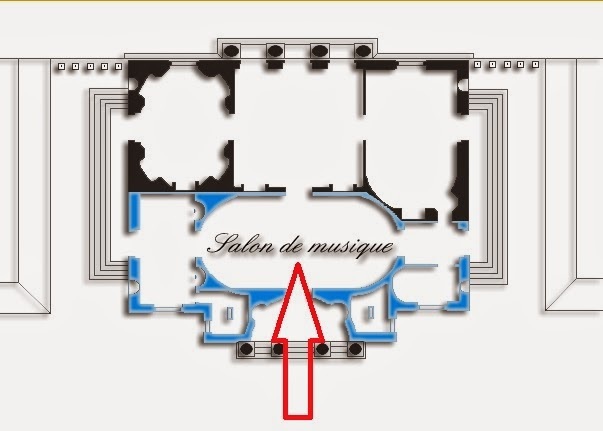 Rising to the full height of the pavilion, the principal room (today styled the salon de musique) was faced with light-grey Lesbian marble and had tribunes at second-storey level where musicians could play (though they complained of the cramped accommodation). Large mirrors were framed by pilasters, whose bronze and gold Corinthian capitals broke a frieze of playing children. The ceiling was by Boucher while over the door hung a portrait of Louis XV wearing the ribbon of the Holy Ghost order, a gift to his mistress in 1770. Above all, throughout the pavilion, were the bronze and gilded decorative features designed by Ledoux and executed by the goldsmith Pierre Gouthière; "from the lock of a door to the jamb of a mantelpiece, all was a marvel of taste, of exquisite design and of perfect execution". According to Gouthière, who has left detailed accounts, Madame du Barry would personally go over his designs, criticising the various wax models and sand or plaster moulds. The artist's bills tell of fire-irons in the vestibule that matched the frieze running round the walls, of myrtle designs in the corners of the door, and of four small lustres of crystal and bronze placed before the mirrors. Sadly, Gouthière's industry did not bring prosperity; after almost twenty years workking for the royal mistress, he was forced into bankruptcy in 1787 with 750,000 livres still owed to him. Another much remarked upon wonder were the four marble women, sculpted by Augustin Pajou, who upheld the brackets of bronze candelabra in each corners of the room. 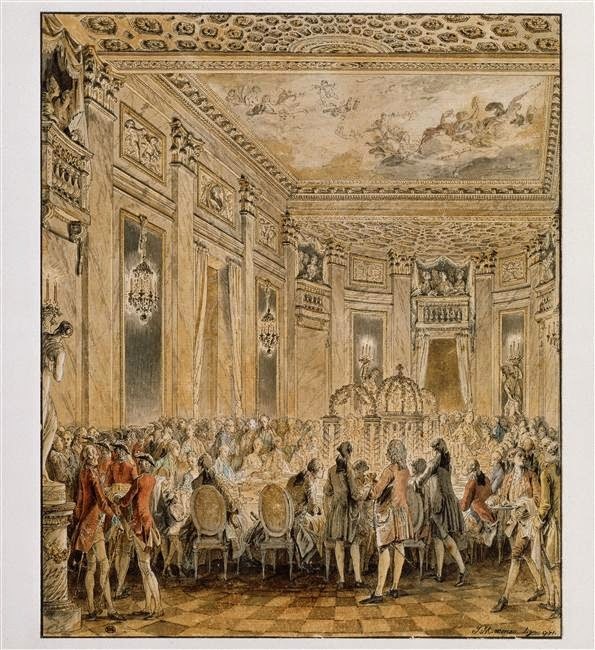 A water colour by Moreau le jeune in the Louvre depicts the inauguration banquet of September 1771, a splendid event in which a play by Charles Collé was performed, dinner served to music and a firework display followed. "There is a water-colour in the Louvre, by the younger Moreau, depicting with sparkling cleverness a supper-party at Louveciennes. The composition of this delightful sketch may strike one as cold, so minute are its details from the squared marble of the floor to the gilded galleries for the musicians, which this evening were occupied by some of the guests of the Countess. Court etiquette was strictly followed in the serving of supper. Louis XV. presided, and the artist has cleverly caught the expression of haughty melancholy in his handsome Bourbon face. ... To his right sits Madame Du Barry, in a very low-necked gown of white satin, with pearls about her throat, and her little head thrown proudly back, a pose that does not in the least detract from her charm and sweetness. Around the table great ladies are seated, and men glittering with orders ; Richelieu, the brilliant wit; courteous, reserved d'Aiguillon; caustic Maupeou; gentle and lovable Chauvelin; and among many others the young Viscount Du Barry, blind as ever to the radiant galaxy of women, to all but the favourite, his faithfully beloved aunt. The footmen move with difficulty among the curious crowd. Madame Du Barry's servants, in full dress livery of red velvet trimmed with gold lace, are aided in their duties by the Swiss Guards in blue uniform with white facings and edgings, three-cornered hats on their heads and swords by their side. Morin, the factotum, supervises their move- ments ; Zamore is also there, a little black page in a pink costume, and Mirza, the white greyhound, that the Abbé Delille had given the Countess. A flowery epergne adorns the centre of the table, and gold candelabra are placed among the piled dishes, masterpieces by Salanave, the favourite's chief cook. Gold plate, chased by Roettiers de la Tour, alternates with Sevres ware, patterned with tiny flowers encircling the monogram of the Countess, a design by Saint- Aubin..."
Behind the vestibule was the main salon whose windows looked out towards the misty view. One imagines the jaded Louis XV relaxing here, taking in the charm of the dusk after a day's hunt at Marly. The modern promo vido emphasises the room's potential (now as then) for dancing and performance. Decorative highlights by the ever industrious Gouthière included entertwining vine-leaves above the twin fire-places, and flower-work features not only in the panels, brackets and embrasures but also in sash-fastenings, locks and door-knobs. The magnificent ormolu fire-irons are no longer in situ, though apparently an original still exists at the Château de Compiègne. 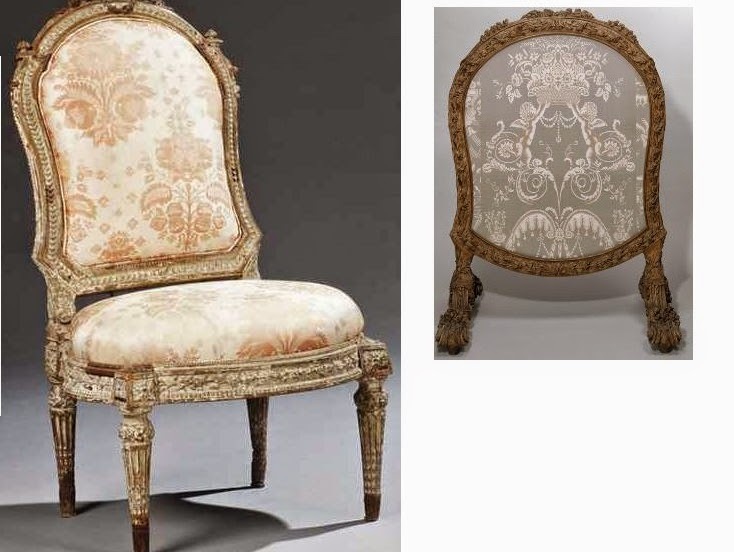 Expensive figured Gobelin tapestries, with themes after Vien, once adorned the panels and the famous bust of the favorite by Pajou resided on an altar of white marble, gold and silver (a copy now sits somewhat more prosaically on one of the mantelpieces), Straight-legged neoclassical chairs by Louis Delanois, from this room and elsewhere in the pavilion, can be found in various museums and still turn up from time to time at auction. "In the evening we were usually alone at the fireside, Mme du Barry and I. She sometimes talked to me about Louis XV and his court...Every day after dinner we took coffee in the pavilion which was so famous for its rich and tasteful decorations. The first time Mme du Barry showed it to me she said: "It was here that Louis XV did me the honour of coming to dinner. There was a gallery above for musicians and singers who performed during the meal." The salon was ravishing; besides enjoying the most beautiful view in the world, the chimneypieces, the doors, everything was of the most precious work, even the locks could be admired as chefs-d'oeuvre of the goldsmith's art, and the furniture was of a richness and elegance beyond description." In 1786, however, it was no longer Louis XV who enjoyed a siesta here buy Madame du Barry's faithful lover of latter years, the duc de Brissac (later to be cruelly lynched by a Versailles mob and have his head unceremoniously lobbed through Madame's open drawing room window). Two smaller salons led off the salon du roi, the one on the right, now called the salon Ledoux, was the salon cul-de-four in the 18th century (for its curved walls). Now pretty much empty, it was here that Fragonard's gorgeous series of paintings, The progress of love, had been intended to hang, replaced at the eleventh hour by four rather more pedestrian canvasses by Vien. Reproductions of the Fragonards can now be admired in the salon opposite - not sure why they have been sited there but it doesn't much matter. In Madame du Barry's day this last room was all mirrors with a chimneypiece of carved lapis lazuli. The ceiling, by Élisabeth Vigée Le Brun's mentor Gabriel Briard, was on the subject of rural pastimes, with the motto "Ruris amo" - I love the countryside. Hum, I guess a lot depends on the amenities! 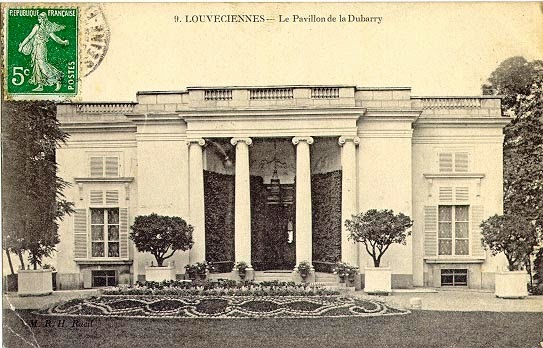 David Pendery, "A look back at Louveciennes". Collection of materials compiled by photographer and computer graphics expert David Pendery, a former student of the American School in Paris which was based at Louveciennes between 1959 and 1967. Claude Saint-Andre, A king's favourite: Madame du Barry and her times. Published in 1915. I went to school there from 1965-1966. Cool. Did you notice the site by David Pendery? - he went there too.